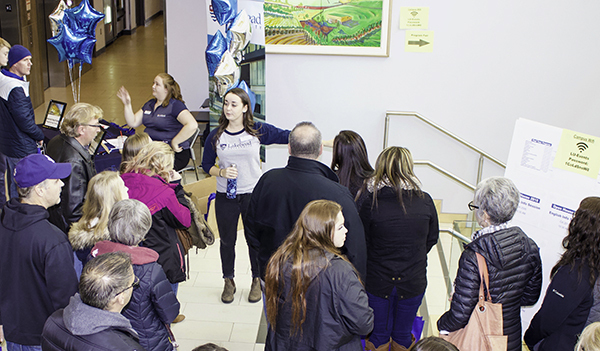 Parents and guardians of future Lakehead University students are invited to meet staff and advisors at the Parent Information Night at the Orillia campus on Tuesday, November 20. While the event is geared towards parents and guardians, high school students and their families interested in learning more about Lakehead University are welcome to attend. Lakehead University staff and advisors will be on hand to answer questions and lead sessions on how to choose a program, an overview of the admissions process, and financial aid, scholarships and bursary offerings. The evening will also include information regarding on-campus services and supports. Campus and residence tours will also be available. The information night takes place at Simcoe Hall at the Orillia campus, starting at 6:30 p.m.
Attendees can choose to attend sessions and campus and residence tours at select times throughout the evening. Choosing a Program and How to Apply includes an overview of Lakehead University faculties and programs. It will also describe the process of applying to Lakehead. Presentation will be held at 6:30 and 7:30 p.m.
Financial Aid, Scholarships and Bursaries will take a look at the various funding opportunities available to students. It will go over the $11 million in funding available each year to new and returning students. Presentation will be held at 7:00 and 8:00 p.m.
Will be offered at 7:00 and 8:00 p.m.